Expertise of Pranshu on servo motors is utilized to do repair work of any type of imported servo Motors. We have fully trained and experienced technicians to carry out the repairs of printed armature or Disc Motors of any make, Permanent Magnet DC Servo Motors and AC Servo motors. Pranshu works to finer tolerances, more demanding specifications and tougher test procedures than other repairers and offers refurbishment to manufacturer’s standards and specifications. In other words the performance of the repaired motor will be as good as a new motor. Inspection of condition of all parts used in the motor. Submission of quotation with advice of cost and delivery. 100% cleaning of every part. 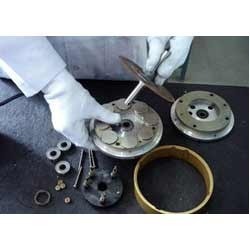 Rewinding of Armature with replacement of commutator in case of PMDC Servo Motors or replacement of Armature Disc in case of Disc Motor. Replacement of Bearings, Brushes, Shims and pre-load components. Replacement as necessary of any other unserviceable parts – note that the delivery time is subjected to the availability of spares. Magnetizing of magnets wherever necessary. Rebuild and run for at least 4 hours load test. Fully functional test and calibration to manufacturer’s specifications. Every motor is supplied with a full test certificate detailing the motor’s mechanical and electrical characteristics. All the repaired motors are covered by 6 months warranty. Looking for Imported Repairs ?